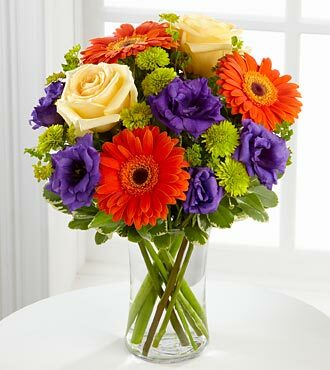 FTD Rays of Solace Bouquet is a cheerful burst of color to extend your deepest sympathies. Crème de la Crème roses, orange gerbera daisies, purple lisianthus, green button poms and a mix of vibrant greens are beautifully arranged in a clear glass gathering vase to create a warm bouquet expressing hope with every colorful bloom. Approximately 20H x 15W.